After sufficient drying time, the ‘doodverf-stage’ of the chandeliers is ready to be subsequently worked with up semi-transparent glazes containing several oil ground colours. Eventually, with all the different elements in the painted scene interconnected, the increased focus, sharpness and colourfulness in the chandeliers, make it necessary to specifically extrapolate some of these characteristics to the other light-catching parts of the painting. In particular, the glosses on the gilded picture frames on the long wall are ready to receive, not only some extra focus and sharpness, but also some more colour contrasts. One of the main features of lead white pigment in linseed oil is that it is drying is so rapidly, that the adjacent glacial layers can often be applied as soon as after one day. The brightness of the white under painting will provide some extra brilliance to the transparent layers applied on top of it. This is specifically useful when imitating the brilliant crystal parts of the chandeliers. In particular mixtures of lead-tin yellow and yellow and brown ochres are very appropriate to use at this stage. 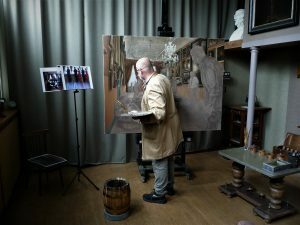 The next step will be to work on the other main light source which is even more dominating the scene of the painting. In addition to the much sharper and more concentrated electric light of the chandeliers, the abundant ‘cool’ daylight reveals itself distinctly flowing into the Galerij through the two large windows, while being partly filtered by the draped semi-transparent net curtains. Being the most important source of light in this space and thus in the painting, the daylight covers a much larger area in the overall scene. Of course, when painting these different light sources, it is important to have their different features play their own specific role in the DIOGENES-scene. 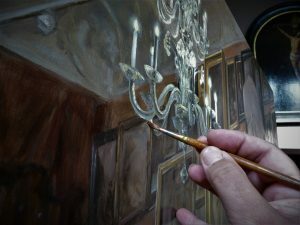 As was done with the chandeliers, the under painting of the windows is also applied by an impasto layer containing mainly lead white. To emphasize the structure of the quite abundantly draped semi-transparent net curtains, this undercoat is painted with rather stiff pig hair brushes. The hair of these brushes is specifically adequate for keeping sharp strokes visible in the painted layer. However suitable, in order to prevent this from becoming a rather monotonous structure, some of these areas will have to be tempered here and there. This is done with an ox-hair brush, containing much softer hair, enabling to easily smoothen some of the impasto. After merely one night of drying time, the ‘doodverf’ parts containing mainly lead white have sufficiently dried up to allow some subsequent first glazes. Covering partially dried surfaces with fresh coats of paint is however not entirely without risk. Many paintings, even including works by important masters, have been ruined in this way. The golden rule is simple: lean under painting should be covered by fatty layers, but never the other way around. That is because glazes should never be able to become more brittle than the surfaces on which they are applied. However, only if this coloured layer of different pigments will contain sufficient linseed oil and thus flexibility, it may be possible to prevent ‘craquelé’ from occurring now or in the future. Just like all living creatures, even painters can be mistaken sometimes. Or maybe change their minds in the course of the creation of, for instance, a new painting. With the DIOGENES-painting in this somewhat advanced stage, suddenly it became apparent that the position and the angle of the left-hand wall plinth should be altered just a little bit. Because specifically art historians are very fond of Italianesque vocabulary, but mainly because neither the English nor the Dutch language provide a proper word for it, such changes of mind are called ‘pentimenti’. The occurrence of these alterations, which often can only be detected by x-rays, might indicate that we are dealing with an original and not a copy. 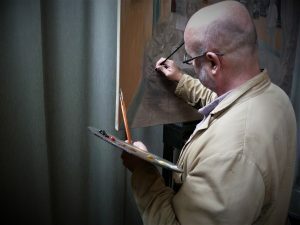 That is because a copyist will always strictly follow what is already there to be seen and is not bothered at all by the thousands of questions and uncertainties connected with the complex process of creating something new. The painting of long thin lines can best be done with a long-haired brush. The most suitable hair for this task is provided by the Kolinski red marten, living in Siberia. That is because the red-brown coat of this weasel like predator contains long hair with a unique feature. After running through the snowy fields and forests, gathering lots of coverings on its fur, this animal only has to shake its body off only once to lose not only all the snow but also the accumulated moisture. Observed more closely, preferably under a microscope, the hair of this fur will hardly show any unevenness. That is why this perfectly smooth surface will be able to easily lose everything covering it. 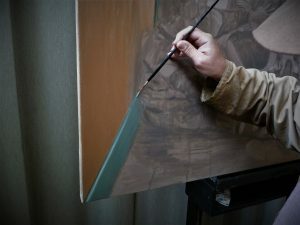 Accordingly, this will also occur to paint being applied with Kolinski brushes. 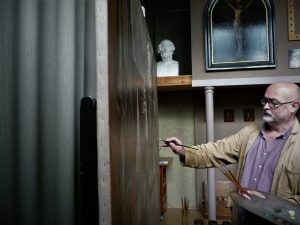 Moreover, specifically for the application of long thin lines, a special painting technique is required. 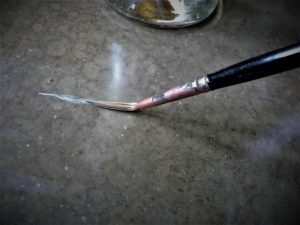 The end of the handle of the brush is held between three fingers, while slowly rolling it over continuously, with the paint-filled hairs dragging behind this linear movement. 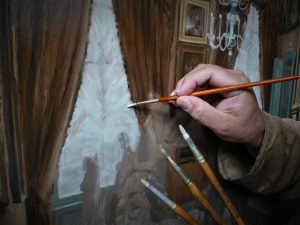 After this single stroke, the paint from the hair has been transferred to the surface in the shape of a new line – and the empty brush itself looks like it has just been rinsed out and cleaned. After applying the corrected contours of the plinth, the area in between can easily be filled in with, for example, a pig hair brush. As we have seen in other parts of the painting, this is done with a colour that might look too light for its purpose. That is because, again after sufficient drying, glacial layers will be applied which will not only affect the final colour, but will also have to simulate the corresponding shine, reflection and shadow of the entire area. 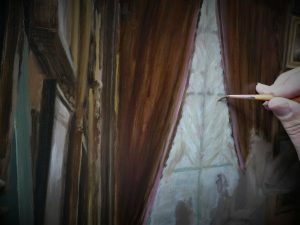 Obviously, the thin edge of the plinth with reflections of the bright light coming from the third chandelier, which remains out of sight from the chosen point of view, is also applied with the same marten hair brush.